The speedy completion of the beautiful Biff-Burger buiding on the Agricola Shopping Center property last week emphasizes the flexibility of the American tyrp building, points out Tom McCartney. Mr. McCartney is owner of the Gadsden Steel Building Company, the firm that erected the Biff-Burger building. This eye-catching drive-in was completed in less than one week! The Gadsden Steel Building Company is the franchised dealer for American Buildings in this area. The National Biff-Burger System hauled in by trailer the drive-in firm's unique Port-A-Unit, which consists of a 10' by 40' porcelain covered steel basic unit, with wiring and plumbing ready for the final hook-up, two restrooms, walk-in cooler and freezer, built-in refrigerator-freezer, ventilating, heating and air-conditioning systems, kitchen with three-compartment stainless steel sink, ice machine, broiler, heavy duty fryers, shake machines, drink dispensers and changemaker. Once the Port-A-unit was in place on the concrete foundation, the Gadsden Steel Building Company crew went to work. The structure was literally erected around and above the kitchen and related equipment. In less than one week, the building was complete. Exteriors of the building is of lifetime, ultra-clean porcelain panels. The interior is of stainless steel, aluminum, formica and plastic, for easy cleaning and low maintenance costs. Mr. McCartney, along with American Building specialists, can design a building for any businessman. Expensive construction costs are eliminated in American Buildings, and functional design speeds service and reduces labor costs. 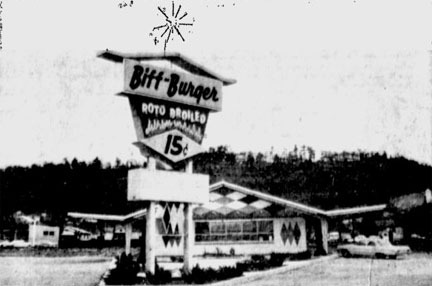 The Biff-Burger building could easily be dismantled and moved to another location if desired -another striking illustration of the practicalness of American Buildings. Mr. McCartney can point with pride to several American buildings he has erected in the area. Businessmen who are contemplating a new building or expanding their existing quarters would do well to discuss their needs with McCartney at his office, located at 309 Railroad Avenue in Attalia. He will welcome the opportunity to design a structure, draw up blue-prints and detail costs. The Gadsden Steel Building Company telephone number is 538-7219.